The six top Republican candidates take economic policy into the wilderness. The six candidates chosen here (based on composite polling) have remarkably similar, unoriginal, inequality-inducing, trickle-down economic recommendations for the country: reduce taxes (mostly on those who don’t need it), “grow” the economy like a sprouting weed, balance the budget by cutting as yet not-delineated social programs, overthrow Obama’s healthcare legacy without breaking up the insurance companies, and yawn… well, you get the idea. If these six contenders were indeed Hunger Games tributes, their skills in the American political wilderness would run this way: Ben Carson inspires confusion; Marco Rubio conveys exaggerated humility; Ted Cruz exudes scorn; Jeb Bush can obliterate his personality at a whim; and Carly Fiorina’s sternness could slice granite. This leaves Donald Trump, endowed with the ultimate skill: self-promotion. As a tribute, he claims to believe that all our problems stem from China and Mexico, as well as Muslim terrorists and refugees (more or less the same thing, of course), and at present he’s leading the Games. None of these big-money-backed candidates seem particularly concerned that another economic crisis could ever cripple the country, or have evidently even noticed that most Americans have yet to experience the present “recovery.” None seem to realize that when the Federal Reserve winds down its cheap money policy and banks and companies are left to fend for themselves, more economic hell could break loose in the style of the 2007–08 meltdown. Jeb Bush recently summed up the general 2016 Republican position on the economy in a single what-me-worry-style sentence: “We shouldn’t have another financial crisis.” ’Nuff said. In the 2012 presidential election, Mitt Romney’s chances dwindled after he disparaged 47 percent of the country as so many leeches. Today’s Hunger Gamers have learned from his experience. Optics spell opportunity, so as a group they’re shuffling the usual Republican-brand tax cuts for corporations and the wealthy in with selective recognition of the broader population and promises to kill all loopholes in some future utopian tax bill. None of them, of course, would consider raising the minimum wage to put more money in the pockets of workers before tax-time hits. Even old Henry Ford knew the power of wages when, early in the last century, he strengthened his car empire by doubling the then-prevailing minimum wage for his workers to $5 a day—enough for them not only to save up and buy his Model-Ts, but also boost productivity. Yes, he was a brilliant neurosurgeon, but the tenacity and skills required to become a gifted medical practitioner have not translated well into presidential-style economic policies. To the extent that he has a policy at all, it’s a shopworn version of the twenty-first-century Republican usuals: ratifying a balanced budget amendment to the Constitution “to restore fiscal responsibility,” introducing a flat tax, not raising the minimum wage, yada, yada, yada. In a Washington Post op-ed last year, he recounted his mother’s days as a “domestic in the homes of wealthy people who were generous to her” and would slip young Carson and his brother “significant monetary incentives” in return for good grades. One even loaned him a luxury convertible. With such employers—and the incredibly rich are a well-known generous bunch, at least when it comes to supporting Republican presidential candidates (just 158 families have contributed more than half the money to this election so far, mostly to Republicans)—who needs a government-declared minimum wage? He would conveniently cut the official corporate tax rate from 35 percent (the average effective tax rate is 27.9 percent but the biggest, brightest companies don’t even approach that amount) to between 15 percent and 20 percent, the definition of corporate manna from heaven. He would also allow companies to bring their foreign profits back to the United States completely tax-free if they would even… pretty, pretty please… consider allocating 10 percent of them to “finance enterprise zones” in major cities. And so it goes in Carsonland. The Donald lists five core positions on his site, including the two economic pillars of his campaign: “U.S.-China trade reform” and “tax reform,” both of which would, of course, “make America great again.” This may already sound a bit repetitively familiar to you, but he wants to reduce the corporate tax rate to 15 percent because it “would be 10 percentage points below China’s and 20 points below our current burdensome rate that pushes companies and jobs offshore.” Given that our biggest companies already pay far less than that “burdensome” rate, can there be any question that lowering it further would produce more generous CEOs and slay dreaded China at the same time? When it comes to tax reform, Trump’s “populist” program would remove 75 million households from the income-tax rolls and provide them, so he claims, with a simple one-page form to send the IRS, saying “I win.” Though he would cut the current seven tax brackets to four—0 percent, 10 percent, 20 percent, and 25 percent—it’s his 15 percent corporate tax rate that trumps the field. 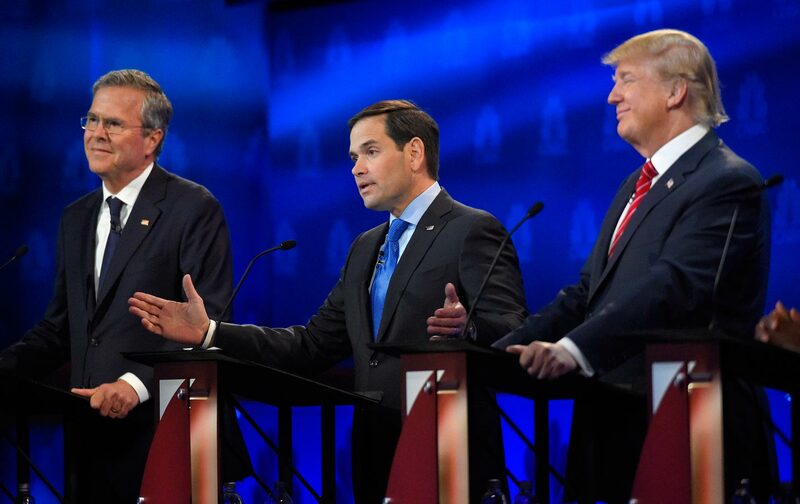 Rubio would only chop it to 25 percent, Bush to 20 percent, Cruz to 16 percent, and Carson… who knows? Various estimates suggest that Trump’s plan would lead to a staggering federal revenue loss (so lucky for us that, in a Trump presidency, the rich would undoubtedly be so grateful that their generosity would soar beyond imagining). The nonpartisan Citizens for Tax Justice computed the cost of his plan at $12 trillion over 10 years. So don’t expect any Eisenhower-esque national building campaigns (other than that “beautiful” wall on the Mexican border). And in true Hunger Games fashion—when the “odds” head in a tribute’s favor, the patrons and gifts begin rolling in—Rubio just bagged Republican mega-donor billionaire Frank VanderSloot. Mitt Romney’s former national-finance co-chairman, VanderSloot joins a growing roster of Rubio billionaires, including hedge-fund moguls Paul Singer and Cliff Asness. Rubio’s tax plan, the “cornerstone” of his economic policy, would—you won’t be surprised to learn—reduce the number of tax brackets from seven to three and eliminate taxes in ways particularly beneficial to the billionaire (especially hedge-fund billionaire) class, including the estate tax and taxes on capital gains and dividends. For the broad population, Rubio includes family tax cuts. According to an analysis by the Tax Policy Center, his plan would be a bargain compared to Trump’s, costing federal government coffers a mere $2.4 trillion or more in receipts over the next decade. As a byproduct, his program is essentially guaranteed to spark a new round of financial speculation, but don’t for a second let the 2007–08 meltdown cross your mind since, as every Republican knows, with a Marco Rubio, Donald Trump, or Ben Carson in the Oval Office, that can’t happen. The Cruz campaign website offers a hodge-podge of semi-incoherent economic salesmanship. His tax plan, or what he likes to call (without the slightest justification) the “next American revolution,” promises to “reignite growth in our economy.” His “simple flat tax” (yep, another of those!) would abolish the Internal Revenue Service as well. Personal income tax brackets would go from seven to… count ’em!… one at a 10 percent rate across the board and the corporate income tax would be replaced by a flat tax of 16 percent. And it should be taken for granted that the American economy would soar into the stratosphere! Cruz claims his simple flat tax will elevate the gross domestic product, increase wages by 12.2 percent, create nearly 5 million new jobs, and undoubtedly fill the world with unicorns. It would also wipe out between $768 billion and $3.6 trillion in federal tax receipts over 10 years. Its economic section excoriates the tax code for being “rigged with multiple carve-outs for favored industries.” He blasts Obama’s economic policies for leading to “low growth, crony capitalism, and easy debt.” Yet, under Jeb’s governorship, Florida’s debt escalated from $15 billion to more than $23 billion. After his term, the housing bubble that had inflated the state’s coffers burst big time, and Florida’s economy underperformed much of the country during the financial crisis. While homeowners statewide went underwater, he landed a multimillion-dollar consultancy gig with… gulp!… Lehman Brothers. Fiorina’s webpage doesn’t offer a lot of economic anything. It’s more like a personality infomercial. For her official positions, you need to watch video clips of her TV appearances from CBS This Morning to late-night talk shows and—if you’re starting to get bored—just imagine Stanley Tucci as Hunger Games host of festivities Caesar Flickerman narrating. According to Citizens for Tax Justice, between 2008 and 2012, 26 of the 288 Fortune 500 firms (consistently profitable in those years) managed to pay nothing, nada, zero in federal income tax. The 288 firms collectively paid an effective federal income tax rate of 19.4 percent, and a third of them paid an effective rate of less than 10 percent. Five companies—Wells Fargo, AT&T, IBM, General Electric, and Verizon—also bagged over $77 billion of the $364 billion in tax breaks doled out in those years. Extra jobs didn’t follow. Think of this crew as the real winners of the American Hunger Games in this period. Perhaps with such a field of candidates, the classic Hunger Games line will need to be adapted: “Let the games begin, and may the oddity of it all be ever in your favor.” Certainly, there has never been a stranger or more unsettling Republican campaign for the presidential nomination or one more filled with economic balderdash and showmanship. Of course, at some point in 2016, we’ll be at that moment when President Snow says to Katniss Everdeen, “Make no mistake, the game is coming to its end.” One of these candidates or a rival Democrat will actually enter the Oval Office and when that happens, both parties will be left with guilt on their hands and all the promises that will have to be fulfilled to repay their super-rich supporters (Bernie aside). And that, of course, is when the real Hunger Games are likely to begin for most Americans. Those of us in the outer districts can but hope for revolution.